Provider of communication skills training and private interview and presentation skills coaching for individuals at all levels of seniority, and for corporate, government, institutional and not for profit organizations. Looking for a coach to help you? Make telephone calls that get results. Move from close “seconds” to winning job interviews. Compete for your own job after the merger/acquisition. Sell to prospective clients after you've turned to consulting. Interview for a new business license. 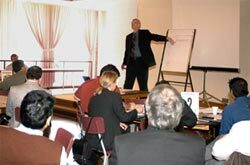 Feel comfortable presenting to your peers or a large group. Where to go with the "20-minute" presentation required at the start of your interview. Avoiding the trap of getting defensive when challenged. Selling you and your ideas without going through a personality makeover. Managing the dynamics and hidden snares in the behavioural interview. Uncovering the real culture of the interviewer’s organization. Connecting your resume to their job description. How to focus on mutual concerns instead of leading with solutions. Represent yourself with confidence when it counts!